I hope everyone has had a good weekend, I spent a good part of mine searching for documents. I eventually found them right on my desk after shuffling them in with other papers. One thing that has helped me a bit on my path is to stay organized. I remember when I was younger and I had a savings account how I would loose the statements. I would be in a panic much like I was this weekend. Frantically searching for the paper until after midnight. Have a “to file” box. Right when I walk in my door I have a box I put all my mail, receipts, paperwork, etc. It all ends up there. Once every few days I will go through this pile and sort it and one by one record and file away as needed. Although I do on occasion forget to place a receipt there and then I forget what I spent it on. Have a spot for everything. I have an old UPS box that I keep all my old statement in, as soon as I reconcile my checkbook I place it in this box ASAP. To many times have I forgotten only to have the statement reprinted since I lost it. I also have a file cabinet for my business and I keep everything of important, from letters to permits and everything else you can imagine. Don’t just leave “stuff” out. This is exactly what I did. When I did the article the other day for how much I’ve made thus far I left it on my desk and worked on a paper and it was mixed in with those paper. So when I went to search for it when I was doing book work I couldn’t find it. Use a calendar or reminder system. I can not speak enough good words for Google Calendar. I have it setup to text me a few days in advanced and the morning of all appointments. Before I would use a paper, but it would get lost or torn. Don’t carry your documents around loosely. I have someone I do work for that does this. Instead of having a nice spot to place it, they carry it around with them. When they go home, go out of state, etc. it’s there with them. As you can imagine they lost a few items. Before I got a clip board and a bag to carry around I would loose paper and lucky it wasn’t anything major, but the other person would loose receipts and the likes. These are just a few of the numerous ways to help keep organized. I invite you to share your method? Is it the simple Shoe Box or do you have an elaborate file system? My Car – You should be able to tell that March was a bad month car wise. At the beginning of March a bad storm came to where I live at and it threw a plastic lid through my back windshield, and side window, and busted out another one. In addition I pay my insurance in 3-month increments and March was the month. 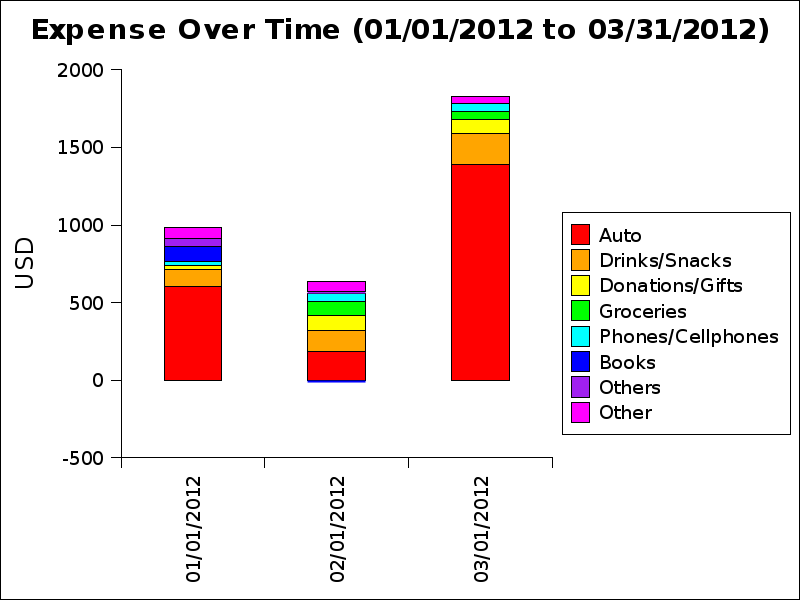 In February you see a good month, less then half spent on my car, which is what I try to do. Drinks/Snacks – This also include food along with when I go out to eat. Which I try to spend less then $60 on, but sometimes it doesn’t work that way since I’ll overspend. Books – I am a college student and for the Spring 2012 term I bought all but one off of Amazon, but that was in December and a few didn’t ship until January. Phones/Cellphones – Right now I pay around $50-$60 a month for my Prepaid Phone. In the past there was times I paid $70 and other times I would pay $20. But now it’s pretty predictable. Other(s) – This is just a catch all for misc. items and to make the graph easier to read. I used to be on a budget and part of it was savings. As you can tell from the last post, I haven’t been keeping up with that goal. Which the goals I had set are going to be the basis of my budget. I want to try to keep Drink/Snacks down to $60 along with trying to pay off my debt and increase my saving. But that will be a topic for another day. Emergency Fund – As I said earlier I have yet to start back on saving in my Emergency Fund. It currently sits at five dollars. Taxes – I just recently paid Estimated taxes to the tune of 450, with about another hundred still in the account. Only time will tell if this was enough. Slush Fund – Need to set this up. By next quarter I hope to have an account established. Place to live – here’s the really dumb part on my move. I have 3,750 but it’s mostly from Student Aid that I have managed not to spend. Student Loans – The original loan was for $5,500. The current principal is $5,299.77. Which mean $200 is paid off of the $750 goal. The only bad part is I have about $60 in interest that I have not paid yet. Credit Card – I only have a $200 credit limit and my last bill was for $0 and currently I only have a $3 balance from Saturday. So on using it less I am making progress. My business which is Computer Repair and Programming seams to be on track. After doing the quarterly book work it’s at $4,505.67. Which my goal is $20,000. So it’s almost a quarter of what I expected. Yet the last two/three weeks have been slow and may explain why it’s not $5,000. But I can live with that. Passive Income – Have yet to establish any, I have been reading blogs, books, and listening to shows on that topic. Lets see if I can get this going soon. This quarter has been an interesting one. First time I’ve installed a security camera system, which was a good learning experience. Always wear dust masks when working with ceilings and walls. But onto some bad events. The beginning of March there was a bad storm which busted out three windows on my Ford Explorer. The repair bill was around $700 but my parents chipped in, which helped a lot. Had my parents not chipped in and with virtually no Emergency Fund this could have been much worst. Now you may be asking me, where’s the expenses? I haven’t had much time to analyse my expenses yet but I can say more was spent on my Explorer then any other category. I will make a new post when I’ve done that. And as always, feel free to comment below. I want to hear your comments and suggestions. If you like this post make sure to subscribe to the feed at the bottom of the site. Thanks and I hope to hear from you soon. Also, on a side note, today I’m 19. With the extra money from gifts I hope to not blow them. I would really like to pay off some debt and/or save but I need to at least make sure I don’t blow it on food and stuff I never use. Finally I am expecting a slight increase in one of my Subcontracting Job and I plan on using half of the excess to pay debt and the other half to fund savings. Which should amount to about $50 for each category per month. Even though I set money goals earlier this week, if I wasn’t to meet them I wouldn’t get to upset. I even expect a few to not be achieved this year. All it would mean is to try harder. Case in point, on debt I have been trying to not use my credit card, well I used it today at Subway. The point of goals isn’t to set in stone events that must happen. Rather it is what I would like to happen. One goal I made was to have $20,000 in gross income from my business and after doing my quarterly Sales Tax return I can say I’m on progress. I was at the $4,500 mark which isn’t half bad in my opinion. It means I must try to beat that the next three quarters, but more on that later on in April. Some goals I set for myself as a person I end up rolling over into a new year. Take the goal of loosing weight, which is also related to spending less on junk food. I have had this goal on my plate for a few years now. Yet I will stick to the goal for a few days then I go talk myself out of it. I will say I don’t have the time and/or energy to and will slowly stop. This is one area I need to change. I should start to care about my goals and not push them off. I need to hold myself more accountable and reward myself for meeting goals. The Subway today was a reward for progress toward the weight loss goal. I went on several small walks, ate fewer snacks, and drank less Mountain Dew. This is a personal weakness, I used to carry cash and would spend it all on Mountain Dew, leading me to stop using cash. As part of starting Staying out of Debt I will start using cash again, slowly. Time will only tell if changing how I view goals will help. I am only a human with weakness, but if I am successful I will come out stronger and less in debt. I would like to hear from you what you do to stay on track. Just leave a comment below.